Going green isn’t always the more difficult option. Sometimes it’s the simplest path, if only people could see it more clearly. Here are a few green things I’ve found to be easier than the regular alternatives. 1. Breastfeed rather than bottle feed. Yes, breastfeeding can be very hard to get started, and for some people it’s impossible. If that’s how it is, absolutely, bottle feed your baby. It’s what’s necessary, and I don’t call that a bad thing. But for those of us fortunate enough to get breastfeeding going well, it’s by far the easiest way to feed a baby, especially in the middle of the night. No mixing formula or washing bottles. Just pop that baby on the breast, make sure the latch is good, and relax. 2. Cloth diaper rather than disposables. I know, I know. Lots of people think cloth diapering is this miserable, hard thing. And poops are gross even when they come from baby bottoms, know what I mean? 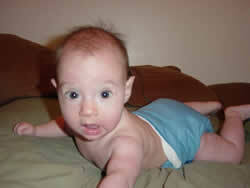 But amazingly enough, I found cloth diapering to be much easier for me than disposables. The laundry isn’t that much extra work. What’s an extra couple loads when you have a family? Do you have any idea how wonderful it is to not need to run to the store to get more disposable diapers because you didn’t realize you were almost out in time? Not to mention no need to buy more diapers all the time anyhow. They’re right in your house, and if you want cute cloth diapers, you can find cute cloth diapers! Not to mention how much money you can save using cloth diapers! Just don’t let the cute cloth diaper addiction get out of hand. 3. Homemade cleaners rather than the usual brands. Some people think that making homemade cleaning supplies is a big deal. It can be a little difficult to make some things; laundry detergent is definitely an effort. Other cleaners, not so much. Baking soda and vinegar handle most things. You can water down the vinegar and add a little essential oil such as lavender to make it smell better, but it’s quite effective. We keep a prepared squirt bottle of it, same as you would for any other cleaner. Sprinkling baking soda really isn’t that much harder than sprinkling any other powered cleaner. Some things need a little extra elbow grease, but most times it’s really not that bad. If homemade doesn’t suit, there are some decent cleaners that are more eco friendly. Obviously, you want to be careful about this one. You don’t want to wear stinky clothes. 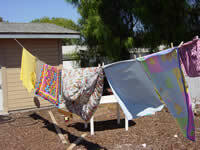 That said, towels and such can easily be used several times before they need a wash with most families. When laundry day rolls around, wash your clothes in cold water whenever possible. I’ve never bought a special detergent for this. Most clothes will come quite nicely clean in cold water. Line drying isn’t lazy, but if you think of it as exercise, you might just have enough of an excuse to go at it anyhow. On hot enough days, it can be faster than the dryer. 5. Handmedowns for the kids. Seriously. I love handmedowns for my kids. Do you have any idea how rarely I buy clothing for my children? It’s not often at all. They get handmedowns from cousins, and that takes care of most of their needs, even after the stuff that’s stained or worn out is removed from consideration. I don’t have to take the time or spend the money on shopping, my kids are still happy to get handmedowns, and it’s all better for the environment than buying new. 6. Stay away from stores unless you need to go there. I’ll admit it. I enjoy wandering stores and seeing all the stuff. The problem is that it’s a temptation I don’t need, and quite frankly the realization of how much waste there is really takes the fun out of browsing. If you tend to impulse shop, keeping away from stores is a great way to cut that habit down. You can’t buy something on impulse if you never see it. Saves on gas and unnecessary purchases. 7. Replace bottled water with filtered water. Many people swear they can’t stand their local tap water, and that’s why they buy bottled water. Thing is, many brands of bottled water are simply filtered tap water. Why pay such a premium when you can filter it yourself? You can even take this water with you when you’re on the go. Get yourself a good quality reusable water bottle. You’ll have your own filtered water ready when you need it. 8. Buy a programmable thermostat. Installing a programmable thermostat has the potential to save 15-25% on your heating and cooling costs. That’s not a bad deal at all, plus you can set your house to be the right temperature for the time of day, and not have to worry about fiddling with the controls or leaving the heat or air conditioner on all day when you go to work. Just program it and let it run. 9. Choose energy saving electronics and appliances when you replace old. It’s not terribly eco friendly to go about replacing things that don’t need replacing yet, although there can be a balance as things get old enough. But when the time does come, pick models which are more energy efficient. It will save you time and be better for the environment without any extra effort. You can also get a smart power strip for your computer or television. This power strip powers down accessories when you shut down the main device. You have to pick carefully, of course, as sometimes you don’t want everything to shut down just because you turned off the TV. Most people don’t want their DVR to shut down at such times, as it may have other shows to record, and if you’re stuck with a cable box, it would need to be on for the sake of the DVR. But it’s nice to have the other electronics shut down because they aren’t in use. Being aware of the impact your lifestyle has on the environment isn’t always as difficult as it sounds when you first consider the problem. It’s not all about sacrificing comfort and going off to live in a cave. Matter of fact, it’s not at all about living in a cave. If you want to be more environmentally conscious, try these simple steps to get things moving. 1. Be more aware of the resources you’re using. Just take a little time and think about what you’re using when you do things in your daily life. How much electricity and water do you use in a day? How much gas do you use? How much stuff do you buy? Awareness may not sound like much, but it’s the first step in taking action to decrease your use of resources, especially the ones that aren’t renewable. 2. Find ways to cut back on the resources you use. Once you’ve become more aware of the resources you use, you can also consider ways to cut back on what you use. Not only is this likely to be better for the environment, using fewer resources usually saves you money in the long run and often the short run. It’s not all about getting off the grid or things like that. Such things are beyond what many can afford, although if you can make it, it’s not a bad choice. It’s about looking at what works for you, such as replacing light bulbs with more efficient bulbs, turning lights and electronics off when they’re not in use, carpooling or using public transportation, shopping less, taking shorter showers, things like that. Things that fit into your budget. Reducing is the most important step, but after that comes the reuse of the resources you already have. This can be as simple as finding a new use for that glass jar the spaghetti sauce came in or using an empty gallon jug for watering plants in the garden. You could even make a reusable shopping bag out of an old pair of jeans. The point to reusing things is to remember that just because something has served its original purpose doesn’t mean it’s garbage already. Think about other ways you could reuse things before you throw them out or even send them for recycling. Consider buying some products specifically because they can be reused, rather than buying single use products over and over again. Water bottles are a great example of this. Drinking water is a great, healthy habit, but buying bottled water is not. Not only are the bottles wasteful, bottled water is less regulated than your tap water in most places, and may not be as good for you as you think. 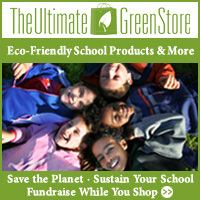 Get a water filter if you really need filtered water, and carry a reusable water bottle with you. A good quality one will save you money over the cost of buying bottled water. Also consider a good quality reusable shopping bag. This won’t save you money if you aren’t charged for paper or plastic bags by the store, but just think about how fast bags add up in your home. That’s a lot of waste you can prevent. Reducing and reusing your use of resources is important, but we all have to use some resources. There’s no way around that as long as we’re alive. What you need to consider is how to allow resources to be reused when possible. Recycling is much easier now in many communities than it was even a few years ago. Large recycling bins are more common now, and you often no longer even need to sort your recyclables to have them picked up. Pay attention to what can be recycled in your community, as not every one has the same rules. If recycling isn’t easy in your community, find out what it takes to get the job done. If you have to drive to a recycling facility, decide how often it’s worth it to you, and how you can store recyclable materials until that time. Particularly important is to pay attention to how you dispose of electronic waste and hazardous waste such as old paint, certain types of batteries and so forth. It cannot just be disposed of in the trash. Many communities have particular places or particular days where they will allow you to bring in electronic waste such as old computers, televisions and so forth, or for the disposal of hazardous wastes. Some of these can be recycled in this way, while others need more careful disposal. You won’t completely appreciate the environment if you don’t get out into it. Go for a hike, head out to the beach, even walk around your own neighborhood. Get out and enjoy yourself outdoors. This is especially important to do as a family when you have kids. If you’re trying to be more environmentally conscious, then you’re probably trying to teach them the same, and how are they going to understand what they’re protecting if they don’t see enough of it? Back when I bought my daughter’s Klean Kanteen (and we have one now for my husband to bring to work too), I took a long time deciding which brand to buy. Sigg’s a huge name, but in the end I chose Klean Kanteen because I would sooner trust stainless steel than coated aluminum. Now that Sigg has admitted that their bottle liners do contain but not release BPA, I’m glad I did. I thought they were wording things in a rather interesting way when I was doing my research. It was always about BPA not being released, very carefully avoiding answering the question of if it was present at all. BPA doesn’t worry me that much a lot of ways, but there are enough questions about it that I would just as soon avoid it out of principle. Besides, you damage the coating you get exposed to aluminum, which has its own problems. Now Sigg has admitted that they’ve had to change their liner formula to get rid of BPA. There are some really great articles on how all this went over on Z Recommends, Tree Hugging Family and Non Toxic Kids. This kind of thing is a huge mistake for any company to make. Just because your evasive answer may have been technically accurate doesn’t mean people won’t feel betrayed when more information comes out. No one likes to feel as though they’ve been tricked. Sigg’s going to have to do some repair work on their reputation after this mess.